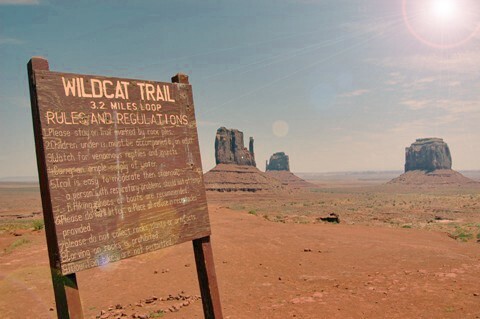 The Wildcat Trail is the only hiking trail inside the Tribal Park that visitors can hike unescorted by authorized Navajo guides – it departs from The View Hotel. Greet Father Sun by taking the Wildcat Trail Walking Tour. You will descend into theValley and walk entirelyaround the Left Mitten! This 4-mile hike, starting from the hotel, is one of the most beautiful trails that you will ever follow. Sunrise at Monument Valley greets you with a myriad of different colors. It’s as if the skies were made of molten lava. The trailhead begins at the primitive campground. From this vantage point, the panoramic view is different than from your hotel room. As you descend nearly 900 feet to the bottom of the valley floor, you will be in awe of the immense size of these sacred monoliths, carefully sculpted by the winds of time. Reaching the base of the giant monuments, unable to fit them in your cameras view finder, you now know this is truly the work of the creator. Follow the trail in a clockwise path around the Left Mitten – this is the direction that the Navajo take, the same as the traditional movement inside a Hogan. You’ll witness immense sand dunes with ripples that appear to be caused by the stone tossed into a clear still pond. Vegetation that has a beauty of its own, you can start to respect how it survives in this harsh but beautiful environment. Reaching the back side of the mitten butte, you feel as if you are now looking at a completely new creation. Take one last look at the sun as it warms the entire valley and bathes it with brilliant colors. Walking the stream beds, you will see the erosion that sculpted these works of art over the millions of years. Castle Rock to the north, rises majestically above the valley floor and the Blue Mountains peaking around its corner. As you ascend back to the top of the mesa, you feel such peace and serenity unlike you’ve ever felt before.